Unique among the northern Mecklenburg towns, Davidson has a distinct, historic downtown. 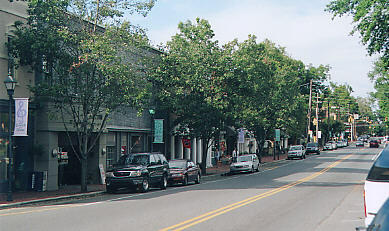 While other towns try to revitalize their downtowns, Davidson’s has always been a vibrant district of shopping, dining and relaxing. Downtown Davidson is a five minute walk from John Marshall Custom Homes ‘Davidson Springs’ neighborhood which is tucked into the heart of old Davidson. The downtown district features the Summit Coffee shop, great retail locations such as the Village Store and Monkees, and fine dining including the Soda Shop, Toast, and the Flat Iron Tap Room and Grill. For more practical matters there are three banks and a CVS pharmacy as well as the US Post Office. On weekends the downtown district is host to the Davidson Farmer’s Market, and in the summer months ‘Concerts on the Green’ provide a variety of musical entertainment. One of the great things about living in the heart of downtown Davidson is being able to walk to and from these great events.